The chart also shows the Distribution Coverage Ratios (DCRs) for the group based on either the trailing twelve month number (calculated using actual distributions paid in the period as per the filings, versus using the most recently declared distributions) or the most recent quarterly DCR if that ratio is less than 1.0x (again using actual cash distributions paid in the period as per the 10-Q). In a general sense, a DCR below 1.0x is potentially cause for concern (the dotted red line in the chart is at DCR 1.0x). I have seen some recent conjecture that part of Hedgeye’s thesis on why Kinder Morgan et. al. is a “House of Cards” (really great headline writing with that tag line) might have something to do with their estimates of Maintenance Capex, so I put together the above chart to compare the peer group’s numbers. Yes, Kinder Morgan Energy Partners (KMP) and El Paso Pipeline Partners (EPB) are on the lower end of the peer group and both are below the peer group average of around 8.5% (which could be completely irrelevant if Hedgeye contends that every single MLP has wildly understated maintenance capex, we’ll have to wait and see tomorrow). The numerous MLPs shown all have different asset portfolios and various assets that are not long haul pipelines, like KMP’s oil production, so underlying assets drive some of the differences. In addition, some costs that make sense as “Maintenance Capex” can show up as operating expenses instead of capital costs. Every single GAAP set of financial statements include many, many management estimates, allocations and assumptions, that’s just how it works. The ongoing critical element is always how the market perceives the management and their financial statements and whether or not that perception changes over time. I think it unwise to just dismiss analysis out of hand (especially before even seeing it) simply because the person is “only 26 years old” or “likes to fish.” I mean seriously, I find that comically irrelevant, were you any less intelligent when you were “only 26”? Was I? Was Einstein? I don’t think so. If you only seek out other viewpoints that agree with yours then you may be suffering from confirmation bias. Confirmation bias does not enhance your investment performance. 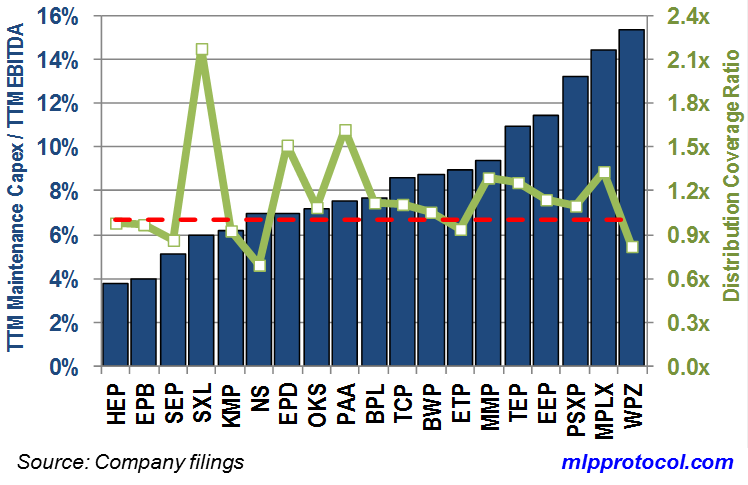 This entry was posted in Chart of the Week and tagged distributions, dividends, EPB, investments, Kinder Morgan, KMP, Master Limited Partnerships, MLP, MLP maintenance capex, MLPs, yield. Bookmark the permalink. I agree age is irrelevant in regards to research. I am not an accountant but I was a business owner. When you consider depreciation of assists, cap-ex spending, unknown liabilities (pipeline ruptures). and who knows what else. Some where along the line you have to put a certain amount of faith and trust in past history and management. If there is a better CEO in the MLP world than Rich Kinder please tell us so we get invest there too.